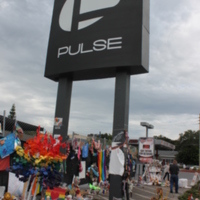 Original photograph of a sign in front of Pulse nightclub containing the club's name and logo. The sign is surrounded by candles, keepsakes, stuffed animals, photographs of victims, drawings, paintings, flowers, arts and crafts, which were placed in tribute to the victims of a mass shooting that occurred there. Pulse was located at 1912 South Orange Avenue in Orlando, Florida. In the early hours of June 12, 2016, an American born security guard named Omar Mir Seddique Mateen shot and killed 49 people and wounded an additional 53 at Pulse, a gay nightclub in Orlando, Florida. Mateen, who swore allegiance to the Islamic State of Iraq and the Levant (ISIL), was shot and killed by the Orlando Police Department after a three-hour standoff. The incident was the deadliest mass shooting by a single gunman in United States history, the deadliest terrorist attack in the United States since the September 11th attacks of 2001, and the deadliest incident of violence against LGBT people in United States history. Most of the victims were Latino, as the club was hosting a Latin Night at the time of the massacre. Cravero, Geoffrey. “Pulse Sign.” RICHES of Central Florida accessed April 23, 2019, https://richesmi.cah.ucf.edu/omeka/items/show/9785.